The 7th Hussars were in England between 1905 and 1911, stationed at first at Norwich and later at Hounslow. 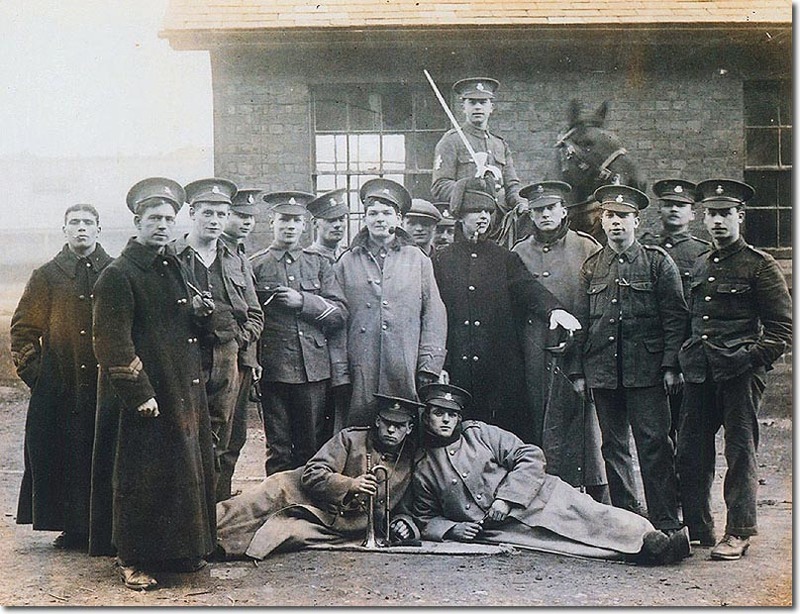 This photo shows an informal group of hussars, mostly in the khaki undress uniform that replaced blue undress in the first decade of the century. The stiff khaki cap was introduced around 1905 and the khaki greatcoat was replacing the long blue (sleeved) cloak worn by three of the men here. One of these men wears the full dress busby with red bag and all white plume. He holds the new issue straight sword, the final cavalry pattern introduced in 1908 for other ranks. The mounted man at the back has a scout's badge on his upper arm, a large fleur-de-lys. One of the men lying down is a trumpeter.